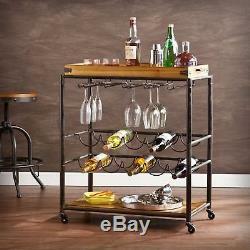 Vintage Rolling Wood Iron Metal Beverage Bar Serving Cart Drink Tray Wine Cart. Round out your entertaining space in versatile style with this handsome bar cart, crafted from a mix of fir wood, engineered wood, and iron. 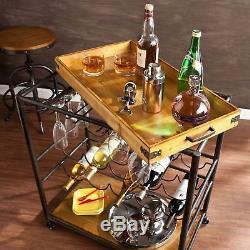 Vintage Rolling Wood Iron Metal Beverage Bar Serving Cart Drink Tray Wine Cart open design adds a breezy touch to your decor, while its wood grain details pair perfectly with plank-inspired canvas prints and rich faux-leather upholstery. Lean into this pieces traditional influence by adding it to a dining room alongside a pedestal base table surrounded by linen-upholstered side chairs to complete the look. 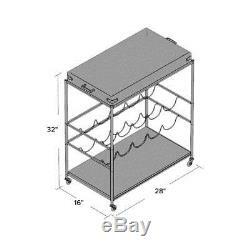 Use this pieces rack to hang your favorite stemware, while its removable tray is perfect for stowing spirits and mixers. Equally at home serving your favorite cheese spread in the living room or serving guests a glass of pinot noir by the pool, the four-wheeled cart is a must-have addition to your favorite aesthetic. Construction Material: Fir wood, engineered wood and iron. Holds up to 10 bottles of wine. Cannot be used without the wheels. Wine Bottle Storage Included: Yes. 2.5'' H x 13.5'' D. 32'' H x 28'' W x 16'' D.
6.5'' H x 26.5'' W x 14.5'' D. The item "Vintage Rolling Wood Iron Metal Beverage Bar Serving Cart Drink Tray Wine Cart" is in sale since Thursday, November 09, 2017. 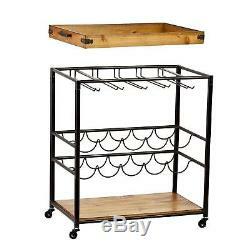 This item is in the category "Home & Garden\Furniture\Bar Carts & Serving Carts". The seller is "shopforlesscorp" and is located in US. This item can be shipped to United States, Canada, United Kingdom, Denmark, Romania, Slovakia, Bulgaria, Czech republic, Finland, Hungary, Latvia, Lithuania, Malta, Estonia, Australia, Greece, Portugal, Cyprus, Slovenia, Japan, China, Sweden, South Korea, Indonesia, Taiwan, South africa, Thailand, Belgium, France, Hong Kong, Ireland, Netherlands, Poland, Spain, Italy, Germany, Austria, Israel, Mexico, New Zealand, Philippines, Singapore, Switzerland, Norway, Saudi arabia, Ukraine, United arab emirates, Qatar, Kuwait, Bahrain, Croatia, Malaysia, Brazil, Chile, Colombia, Costa rica, Dominican republic, Panama, Trinidad and tobago, Guatemala, El salvador, Honduras, Jamaica, Antigua and barbuda, Aruba, Belize, Dominica, Grenada, Saint kitts and nevis, Saint lucia, Montserrat, Turks and caicos islands, Barbados, Bangladesh, Bermuda, Brunei darussalam, Bolivia, Ecuador, Egypt, French guiana, Guernsey, Gibraltar, Guadeloupe, Iceland, Jersey, Jordan, Cambodia, Cayman islands, Liechtenstein, Sri lanka, Luxembourg, Monaco, Macao, Martinique, Maldives, Nicaragua, Oman, Peru, Pakistan, Paraguay, Reunion.